Streamline the process of developing and publishing online Help through single-source, multi-channel publishing and content reuse. Strengthen collaboration among simPRO writers, and facilitate the ability to review and add content. Design a modern Help Guide that aligns with the simPRO websites and creates an appealing, visual experience for customers. Give users an easier and more intuitive way to navigate and find the information they need. Efficiency: MadCap Flare’s topic-based authoring and single-source publishing simplify the creation and delivery of simPRO’s comprehensive Help Guide. Collaboration: MadCap Central fosters collaboration and provides version control while MadCap Contributor makes it easy to edit and contribute content to Flare. Intuitive User Experience: Flare’s top navigation and responsive design provides users a modern, intuitive web experience on users’ device of choice. Improved Navigation: Drop-down text lets customers view only relevant content, giving them more control over their experience. Google-like search makes it easier for them to navigate the Help Guide and find what they need. Easy Customization: Snippets, conditional tags, and CSS enable simPRO to customize content for different countries and products, as well as the look and feel of the Help Guide to match simPRO’s branding. Around the globe, companies in the field service and trade contracting industries turn to cloud-based job and project management software from simPRO to optimize their business processes. Using simPRO’s market-leading, end-to-end solution, service, project, and maintenance trade contractors are able to achieve greater accuracy and efficiency, as well as streamline their businesses. Today, more than 100,000 users from 4,000-plus businesses rely on simPRO—from heating, ventilation, and air conditioning (HVAC) companies to firms in the plumbing, electrical, security, and fire sectors. simPRO&apos;s learning resources support both external users of the software, and internal users, such as the customer support team, to do their jobs more efficiently. To assist these users, simPRO provides an HTML5-based Help Guide that serves as the company’s comprehensive product documentation. This online Help Guide offers users a modern web experience, including top navigation and responsive design that automatically scales the view of content for users’ different screens. The Help Guide was created using MadCap Flare topic-based single-source authoring and MadCap Central for cloud-based content management, collaboration and publishing, which has significantly reduced the time it takes for the simPRO Learning and Development Team to develop, produce, and maintain its content. In the past, Help content was created by different teams using different tools. 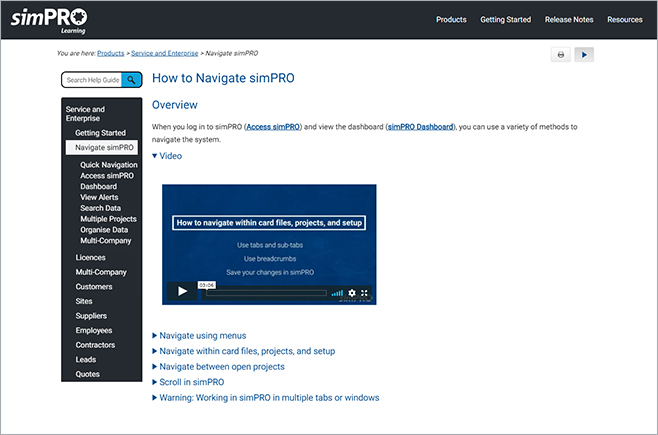 For example, simPRO technical writers produced online Help Guides for external users using knowledge base software. Meanwhile, the simPRO customer support team had its own internal Wiki pages. Also, the software used to create the online Help Guide was becoming inefficient for simPRO writers to create, update and maintain content in multiple places. Additionally, the content was adapted from a paper-based manual, which resulted in lengthy articles that looked outdated, were not optimized for online viewing, and were too overwhelming to read. An evaluation of authoring tools quickly led the team to MadCap Flare, which provided the features needed to create a more intuitive, easy-to-navigate website that would contain all of their documentation in one location. “With advanced capabilities such as single-source publishing, top navigation, and the ability to use cascading style sheets, Flare seemed like the clear choice to help us meet all our goals,” Doherty explains. “Flare’s multi-language function was a contributing factor, since we’re expanding globally and want the option to be able to translate the Help Guide into different languages in the future,” Harland notes. Using MadCap Flare, the Learning and Development team was able to design and launch the new website. Today, the HTML5-based site acts as a single, comprehensive Help Guide that documents all simPRO products. These include simPRO’s flagship business management product, simPRO Enterprise, as well as add-on products: simPRO Mobile, simPRO eForms, simTRAC, and more. By leveraging MadCap Flare’s topic-based single-source publishing, simPRO’s technical writers have streamlined the process of creating and producing the Help for these products. Meanwhile, topic-based authoring has allowed simPRO technical writers to switch from the traditional, linear format to a more flexible, modular approach with their content creation. The team uses a combination of snippets and conditional tags in Flare to write content once and use it in different locations. This has reduced the time it takes to update content, allowing the team to more easily publish concurrently with the company’s product releases. “Snippets are useful in tailoring content for features that are specific to a product version or a country. So, for features that are only for the US, we can easily include a snippet that specifies this at the top of the article,” Harland says. Meanwhile, conditional tags are used to update sections of content in preparation for upcoming releases. The team can simply apply conditional tags to appropriate content and remove the tag when the content is ready to be published, or leave the content tagged for publishing at a later date. Three additional features have helped speed the publishing process: the ability to preview builds before publishing; the HTML text editor; and the link viewer, which allows writers to see how a specific file is connected with other files before deleting them. MadCap Central’s seamless integration with Flare helps multiple people to share and manage changes to files in a central location. As a result, team communication and content quality have greatly improved. The simPRO Learning and Development team consists of instructional designers, multimedia developers, subject-matter experts (SMEs) and technical writers. To strengthen collaboration and manage source control, the team uses MadCap Central, a cloud-based content management collaboration and workflow solution. Additionally, simPRO uses MadCap Contributor, which is fully integrated with MadCap Flare, to help writers and SMEs easily review, edit, and contribute content to a Flare project. Technical writers also rely on the annotations and track changes features in MadCap Flare, which enable them to review each other’s work and clearly see changes to the content. By moving from the traditional tripane format of online Help to Flare’s innovative top navigation output for HTML5, we’ve achieved a sleeker, more responsive layout that is appealing and intuitive to users. By leveraging MadCap Flare’s top navigation and cascading style sheets (CSS), simPRO has been able to customize the look and feel of the Help Guide to provide a modern, user-friendly web experience. “By moving from the traditional tripane format of online Help to Flare’s innovative top navigation output for HTML5, we’ve achieved a sleeker, more responsive layout that is more appealing and intuitive to users,” Harland says. At the same time, Flare’s CSS functionality has given the Learning and Development team more control and flexibility over designing the Help Guide interface to match the company’s websites. Flare’s mobile capabilities have been incredibly valuable, especially since a number of our users rely on the Help Guide out in the field and need it to be easy to read. The new simPRO online Help Guide features a responsive design that delivers content designed for viewing on different devices. The technical writers also use Flare’s mobile medium to create Help Guide articles for the simPRO Mobile app, that are specifically designed for mobile viewing. “Flare’s mobile capabilities have been incredibly valuable, especially since a number of our users rely on the Help Guide out in the field and need it to be easy to read,” Doherty states. The team uses other MadCap Flare features to create a more interactive experience for users and improve their access to content. These include drop-down text, advanced search capabilities, and integrated multimedia. Drop-down text enables simPRO technical writers to minimize the amount of content that shows in an article. Users can click on a heading to expand or collapse the hidden content and view what is relevant to them. Additionally, MadCap Flare’s Google-style search gives users a quick and familiar way to find content. Meanwhile, simPRO technical writers leverage MadCap Flare’s ability to embed Vimeo videos into Help Guide articles to provide customers a richer, more visual learning experience. The team also uses MadCap Capture, which is also integrated with MadCap Flare, to easily generate and edit screen captures used in the Help Guide. “With MadCap Capture, when we need to update an existing screenshot, we can easily click one button to retake the screenshot, and it is saved in the same spot, which is far more efficient,” Harland explains. Our new Help Guide has made it easier for the support team to help our customers while encouraging customers to self-help because of the increased information sharing; it’s a fantastic benefit. 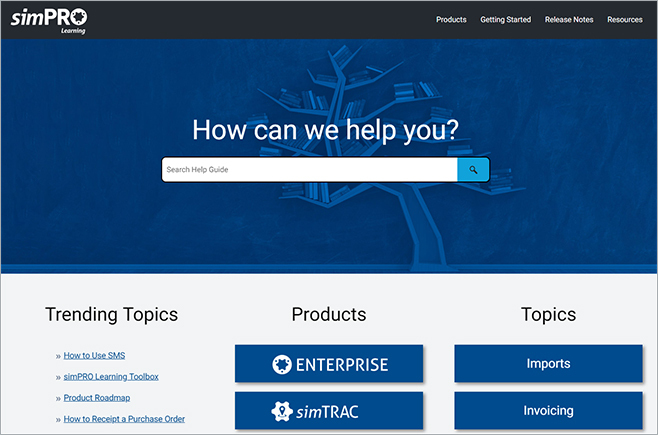 Since releasing the new Help Guide, simPRO has received positive feedback from both internal and external users about how it’s significantly easier to find and understand the content they are looking for. The simPRO customer support team, which is one of the company’s biggest internal users, now uses the MadCap Flare-based Help Guide instead of its previous Wiki pages. The support team can refer to the Help Guide and share links with customers, making resources easily available. “Our new Help Guide has made it easier for the support team to help customers while encouraging customers to self-help because of the increased information sharing; it’s a fantastic benefit,” Doherty said.